I always love a good fashion wish list. The "if I won the lottery and could stock my closet with anything" sort of wish list. 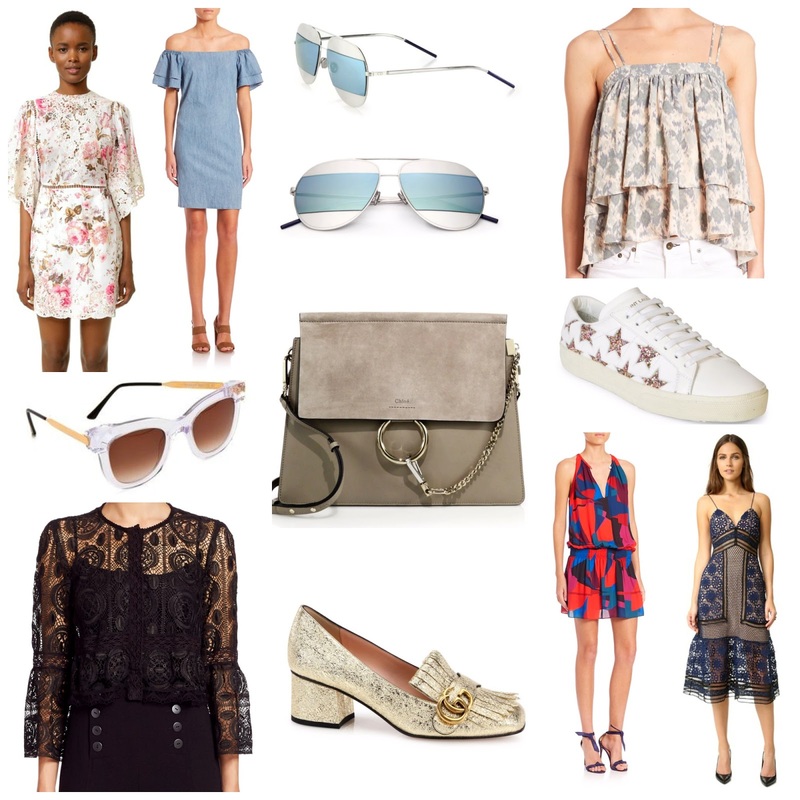 I rounded up a bunch of splurge items that I am loving and would love to have in my closet. 1. Zimmerman Eden Embroidered Dress - I have been lusting after Zimmerman pieces for more than a year now. This one has such stunning delicate detail that I can imagine myself wanting to wear it all the time. 2. Alice & Olivia Off-the-Shoulder Dress - I've seen a ton of lower priced versions of this style dress, but the fitted shape and double ruffle sleeves makes this definitely splurge worthy. 3. Dior Metal Aviator Sunglasses - There are aviators and then there are these Dior aviators. The colored inset makes them much more interesting than a standard mirrored lens. 4. Prose & Poetry Tank Top - I can see this top worn with distressed jeans, cut-offs, slim white jeans or a chic pencil skirt. It is so versatile yet still a conversation piece. 5. Thierry Lasry Sunglasses - The shape of these is quite conventional, but the clear frames make them easy to wear with any and everything. 6. Chloe Faye Medium Shoulder Bag - This. Bag. THIS BAG! If there is one splurge item on this entire list that I want the most - it is this bag. The color, the shape, the detail. It's perfection in my eyes. 7. Saint Laurent Sneakers - Leave it to Saint Laurent to make glitter stars on sneakers the chicest thing ever. 8. Nanette Lepore Lace Top - I can see this top being the perfect option for someone wanting an alternative to a cocktail dress. This will high waisted pants and the most gorgeous stilettos is the way to do wedding guest attire without opting for a dress. 9. Gucci Block Heel Loafers - There is something so striking about these somewhat frumpy high heeled loafers. And the crackled metallic finish makes them even more interesting. 10. Ramy Brook Paris Dress - The pattern, the shape, the colors - this is THE dress for a summer night out. 11. Self Portrait Strappy Lace Dress - Self Portrait is another brand I have been lusting after for the past year or more. The designs and details of every piece is like no other. This one seems perfect for year round events and I can see it being a closet staple even after 10 years.